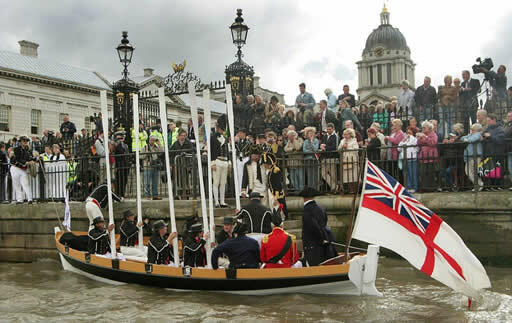 The recreation of Lord Nelson’s funeral procession on the River Thames in 2005 was one of three keystone national events commemorating the death of Admiral Lord Nelson and the British victory at the Battle of Trafalgar. 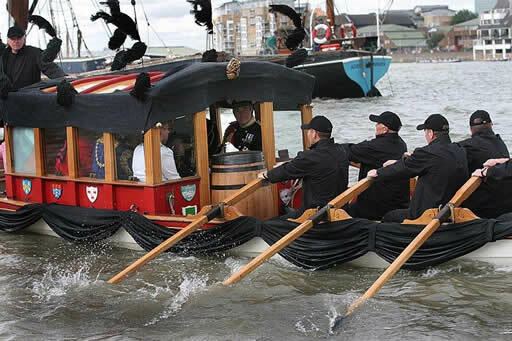 It was promoted, designed and organised by Peter Warwick, then Vice Chairman of the Official Nelson Commemorations Committee, who brought together a small team of experts associated with the river and Great River Race, notably Roger Mutton, Paul Satow and Stuart Wolff. Many other organisations were also involved, such as the Honourable Company of Master Mariners, The Worshipful Company of Watermen, The Greenwich Foundation and Docklands Business Club. 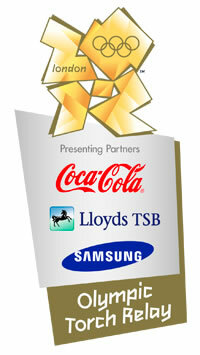 Funding was a serious problem until even five weeks before the event when Emirates agreed to become lead sponsor. It would have been scaled-down without this remarkable commitment. The doggedness and commitment of the team to win through ensured that the scheduling of the pre-event actions never lost momentum, and the success of the re-enactment led to the formation of Thames Alive. The Emirates Thames Nelson Flotilla consisted of a ceremony in the Painted Hall, Greenwich, where Lord Nelson had lain in state, involving The First Sea Lord, Admiral Sir Alan West GCB DSC ADC, the Flotilla’s patron, The Lord Boyce, the Lord Mayors’ of London and Westminster and members of the Royal Navy, Royal Naval Reserve (HMS President), Marine Society and Sea Cadet and Pensioners from the Royal Hospital, Chelsea. 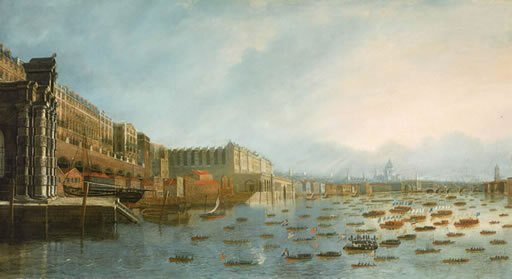 The New Trafalgar Dispatch was then paraded to the Queen’s Stairs where the royal shallop Jubilant, acting as the funeral barge, was waiting to receive the replica coffin and ‘chief mourners’. Descendents of sailors at the Battle of Trafalgar, including members of the Nelson family joined other vessels in the flotilla. 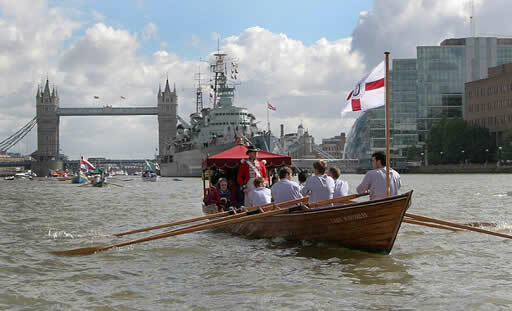 Jubilant was escorted by forty other boats including shallops and barges from the City Livery Companies, traditional Thames Watermen Cutters, HMS Victory’s Cutter, and 28 motor vessels, including Havengore, which had carried Sir Winston Churchill’s coffin in 1965, and Dunkirk Little Ships. 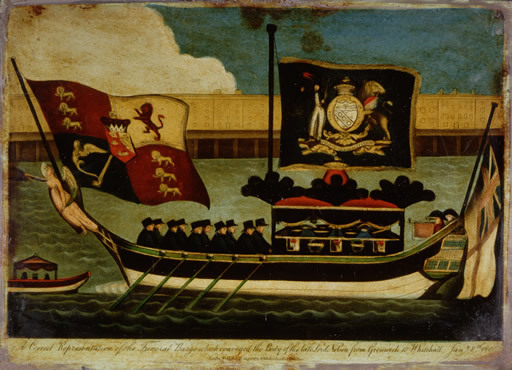 The Thames Nelson Flotilla followed the route from Greenwich to Westminster taken by Nelson’s original funeral procession on 8 January 1806. More than 300 rowers took part and hundreds of thousands of people watched from the river’s banks and bridges. HMS Belfast fired a gun salute. HRH The Princess Royal greeted the flotilla at HQS Wellington and was present as the Dispatch was presented by the First Sea Lord to The Very Reverend Dr John Moses, the Dean of St Paul’s Cathedral, where Nelson is buried. A little over two hundred years later, on 3rd June 2012, another spectacle took place on the River Thames, this time to celebrate the Diamond Jubilee of HM The Queen. Once again, there were a thousand boats on the river and the 1.5 million spectators who turned out in spite of the dismal weather were just as eager to get a view of the procession of boats as their ancestors two hundred years earlier.